1. Global market overview: U.S. stock futures are firmly in negative territory and nearly all European markets are declining in early trading. The Dax index in Germany is looking particularly weak as it dips by about 1%. Most Asian markets also ended the day in negative territory. One thing that is up is the VIX volatility index. As the name implies, the index tracks volatility levels in the market, and it's rising by about 9% Monday morning. 2. Life after oil: Saudi Arabia's government is set to unveil new plans on Monday for diversifying its economy away from oil. Saudi Prince Mohammed Bin Salman, who is second in line to the throne, recently told Bloomberg that "within 20 years, we will be an economy or state that doesn't depend mainly on oil." About 75% of Saudi Arabia's revenue comes from the oil industry, and the oil price crash has forced the government to slash spending and borrow billions. Oil prices are currently dipping by 1% to trade around $43 per barrel. 3. Earnings and economics: Philips (PHG) and Xerox (XRX) are among the key companies reporting earnings before the opening bell. Express Scripts (ESRX) and First Bancorp (FBNC) are the main companies reporting earnings after the close. On the economic front, the U.S. Census Bureau is releasing new home sales data for March at 10 a.m. ET. 4. Weekly market recap: The Dow Jones industrial average and S&P 500 both finished the week in positive territory. The Dow was up 0.6% and the S&P 500 rose 0.5% over the course of the week. 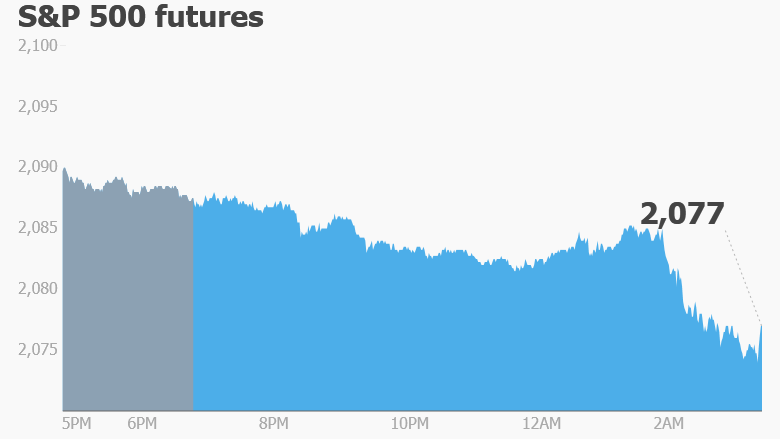 However, the Nasdaq was dragged down on Friday after key tech stocks like Google (GOOGL) and Microsoft (MSFT) fell. It lost 0.7% by the end of the week.